It was one of those stories that wouldn’t have created much buzz among the general public if not for the headlines news editors chose to tease it. 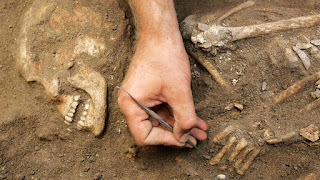 The story was about human DNA taken from remains found in an ancient Canaanite settlement in the area of Sidon. As it turns out, the DNA has a lot of overlap with the DNA of modern Lebanese. Those headlines probably got those stories a lot more clicks than they would have accumulated otherwise. As much as some folks would like to claim the Bible is irrelevant in our world, there does seem to be a lot of interest when it’s “proven” to be wrong. Of course, all that story does is support the biblical account. If you know your Old Testament, you know that God did indeed tell the Israelites to annihilate the Canaanites as they entered the Promised Land. The Canaanites lived there first, after all. If it was going to be Israel’s, then they were going to have to remove the Canaanites. That is definitely a politically incorrect story. It gives me trouble too, if you want to know the truth. The idea of wiping out an entire ethnic group by divine mandate is incredibly disturbing to any right-thinking person. But, here’s the relevant thing for this particular news story that supposedly “casts doubt” on Scripture: it didn’t happen. Israel did not, in fact, wipe out the Canaanites. Judges 1 lists all the places where the Canaanites were still living, going on record to repeat several times that Israel “did not drive out” the Canaanites from those areas. Centuries later, Jesus meets a Canaanite woman (from the area of Sidon, in fact!) and heals her daughter. I don’t expect the media to go out of their way to support the Bible. But they could do a little research before they claim to disprove it. In fairness, a lot of outlets later posted retractions — or at least updates — after I guess enough people contacted them to tell them they got it wrong. By then, of course, the news cycle had turned and the damage was already done. None of this is a big deal, really. What bothers me, though, is what stories like this inevitably turn the Bible into: Ground to be won. Territory to be taken. As surely as Israel invaded Canaan, some media outlet somewhere will try to prop up a “boring” little story on Ancient Near Eastern archaeology by claiming it “disproves” something or the other about Scripture. To which well-meaning believers will respond with all the rage an invaded territory can muster, “defending” the Bible with verses and alternative information and claims of persecution. And the Bible gets turned into something it was never supposed to be. Skeptics, you might not listen to me, but I hope you will: you’re not going to sweep away two ancient religions with one story. Those of us who are believers don’t believe because our Scriptures are inerrant and above question. Our faith, in fact, isn’t in that book at all. It’s in the God whose story we glimpse in the experiences of the people who wrote those Scriptures. Yes, we believe that God somehow inspired those authors. His inspiration, though, was not dictation. Sure, the Holy Spirit could have given the authors of the Bible instant and perfect knowledge of historical events - but then the finished product would sort of lose its human element, wouldn’t it? It wouldn’t any longer be human reflections on God’s work. Believers, listen to me, please: we don’t need to beat the skeptics. Belief is grace and it comes from God. Anyone who thinks the Bible collapses like a game of Jenga because some DNA experts pull out the Canaanite block either doesn’t know much about the Bible to begin with, or has already pre-selected skepticism as his default position. You won’t usually convince someone to believe because you can persuasively answer some actual or perceived media bias. This thing about proving the Bible to be inerrant is wasted energy. The Holy Spirit doesn’t need human inerrancy to do his work. Good thing, because if he works in and through human beings at all, it’s through human beings who make mistakes. If human mistakes don’t invalidate his work in our lives, and in our time, why should we be worried that they might invalidate his work through other lives in other times? The Bible doesn’t create our relationship with God. It helps us understand it, make sense of it, and organize our lives by it. That’s the kind of book it is. We do it a disservice when we treat it like ground to be defended. We miss the point. We fail to communicate what the Bible is about, and who wrote it. Hint: “God” is only the right answer to one of those questions. What? I don’t believe God wrote the Bible? You don’t either, really. You don’t think he put pen to paper. You don’t think he dictated it. You know it’s a human creation that came about because people had encounters with God and found him to be awesome and holy and faithful and compassionate, and they, or others, wrote about those experiences - often decades or centuries after the fact. They wrote about those experiences so that those who came after could know about that God and would seek him and maybe have similar experiences with him. The Holy Spirit was square in the middle of that. He was involved in it. But he didn’t write it, and he didn’t dictate it. So there’s no reason for us to spend much energy defending it. A weaker view of inspiration? You tell me. But it’s a stronger view of the Bible.